How to reserve a town car for airport transfers around the Gainesville and Central Florida area. Whether you travel for business or pleasure, we can provide a great experience to and from the airports in the Central Florida area. We can offer service to Orlando International Airport, Gainesville Regional Airport and Orlando Sanford Airport. Our professional looking town cars are great for business trips and our Gainesville, FL limo services makes for an excellent start or finish to any vacation travel. Fill in the form and get a quick quote to the right. Upon receiving your information, a friendly booking agent will contact you with details regarding pricing and availability. 1. Courteous and convenient. Vacation doesn’t have to wait until you arrive at your destination. Kick-off relaxation right away with door-to-door airport limo services. You can avoid the hassle of long-term parking, imposing on friends or neighbors or taking a ride share with strangers by booking a luxurious limousine to drop you off or pick you up. 2. Relaxing and reliable. Our drivers keep updated on traffic, construction and flight information, so you can relax and arrive on-time, every time, for your flight. With curbside drop-off, it’s easy to navigate bags with check-in and move quickly to security, so you can be on your way promptly. 3. Reserve online or by phone. Our free quote form makes it easy and simple to book limos or town cars in the Gainesville area. Just tell us when you need us and how many people will ride and we do the rest. 4. Great way to travel in a group. 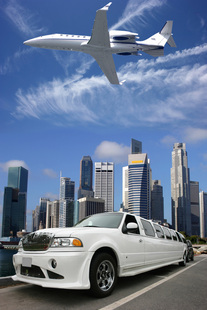 Renting a limo for the airport can be a great and cost-effective way to transport a large group for a flight. Avoid the stress of missing a group member or late arrivals, by arranging limousine service so that you all arrive on time and together.